We are thrilled this month to bring you the beautiful knitted jewelry of Jere Moskovitz! 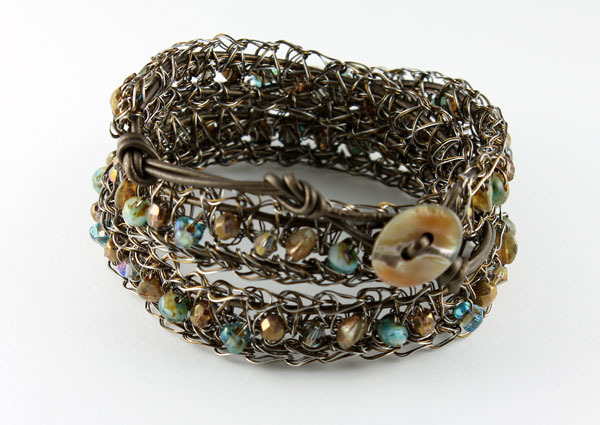 A RISD trained artist, Jere knits with wire, beads and textiles to create stunning pieces of (what else can we call them?) wearable art. Her pieces are modern, stylish, and each completely unique. We have a large selection of her jewelry, from wrapped bracelets to ornamental cuffs to stunning necklaces. Come check out her work, and see if you're not WOWED by this new frontier in wearable knits!